One week today will be St Patrick’s Day so in line with the latest red carpet trends, green will be the only colour to be seen in. Unfortunately for me getting out to celebrate is virtually impossible with 2 children. So at the weekend I plan to celebrate (in advance) with a green drink instead! Instructions: Pour ingredients over ice into a glass, and gently stir. 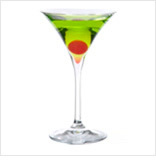 This sweet and fruity cocktail the perfect accompaniment to any St Patrick’s Day bash. Instructions: Shake the contents and pour into a cocktail glass for a simple sophisticated St Patrick’s Day celebration cocktail. Garnish with a cherry. If you fancy winning a St Patrick's Day Celebration Kit courtesy of Midori then head over to the Second Time Mummy Facebook Page NOW for your chance to win. The kit contains: a Leprechaun hat (with ginger beard), 3 miniature (50 ml) Midori bottles , 1 green ice tray, a great Boston Shaker set, and a "grow your own shamrock" kit. Midori is stocked by Asda, Morrisons and Sainsbury’s and is available in 70cl and 50cl sizes. Guide retail price is £9.34 to £14.85.